1.8m long by 15.5cms wide by 11.5cms high. Weight is 14kgs. The SG 600 Series premium screen features an advanced case design with wheels and handles built into each end of the screen to allow easy transportation. The screen also comes with a spring assisted scissor action lift to easily put up your screen and hold the screen tensioned for a flatter surface. The high quality screen surface is optimised for the latest projector technologies. This screen is perfect for PC-based presentations and general purpose video use in a small room. This screen is ideal for a boardroom and suitable for general office or home use with a multi-purpose data projector. Screen surface (viewable area) area is 160cms by 120cms. The housing is a powder coated black metal alloy and measures 15.5cms by 11.5cms. Overall width of screen including housing is 1.84m. The screen surface is matt White (Matt white according to DIN 19045 Type D) with black border and has a lightproof black back. The material is mildew-resistant. The screen has a gain factor of 1.2. 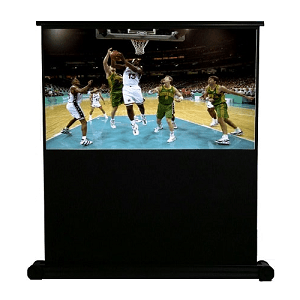 A black leader approximately 900mm high allows the viewable screen surface to be raised to a suitable viewing height. The screen features a heavy duty, scratch-resistant metal case in black. The housing incorporates wheels and carry handles into each end of the housing and has a scissor-action lift to tension and support the screen surface.